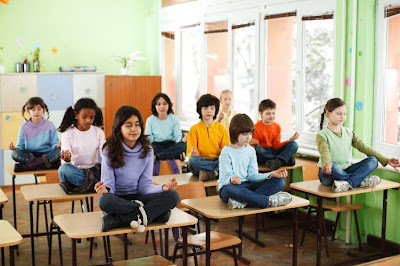 eScienceCommons: Can meditation calm your kids? Can meditation calm your kids? “It calms my mind,” says a regular meditator named Sam. That statement wouldn’t be too surprising, except that Sam is in elementary school. He was one of the children ages 5 to 8 at Atlanta’s Paideia School featured in a recent report on meditation by Dan Harris of ABC News. The students are part of an Emory study into the effects of compassion meditation, a secular form of meditation aimed at helping people reduce stress and think kindly of others. As Harris points out, studies show that compassionate people tend to be happier, healthier and more successful at work. And Sam finds a practical use for it while in an Atlanta traffic jam with his mother at the wheel. “My brother’s screaming, my mom’s cussing, and I’m meditating,” he says. Watch the ABC News report. Are hugs the new drugs? What happened to Obama's passion? Do drones make killing too easy?